Pra Somdej Thaan Singh 2495 BE Niyom Rare Master Class Amulet Luang Phu Nak Wat Rakang Kositaram. An all time classic and extremely rare preferred Pim Niyom amulet of this Master. 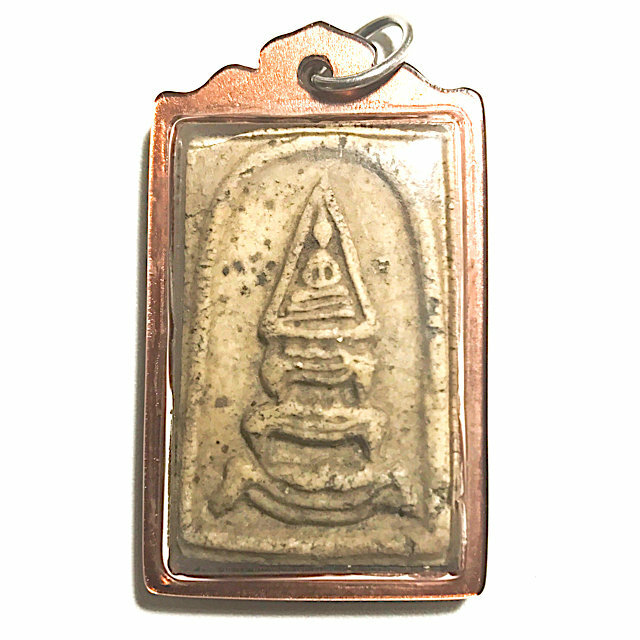 The famous and highly preferred Pra Somdej Thaan Thaan Singh Pim Yai Masterclass amulet of Luang Phu Nak, of Wat Rakang Kositaram, was made in 2495 BE, using old broken amulets and sacred powders from the repository of Somdej Pra Puttajarn (Dto) Prohmrangsri Wat Rakang Kositaram. The Pra Somdej Thaan Singh is one of the very rarest of all amulets of Luang Phu Nak, and this particular exhibit, is in Absolutely Pristine Condition, and has been extremely well preserved for its age. This exhibit possesses ‘Nuea Graeng’ (time-hardened and condensed Muan Sarn clay), which is considered by amulet aficionados an aspect of great importance in the Dtamra Pra Somdej of the lineage of Abbots and Guru Masters of Wat Rakang Temple.